I took the day off yesterday as the Mariners started off their short road trip against the Oakland A's and played as if they were still at home. Leading 1 to 0 from the first inning to the eighth inning, the Mariners collected just one extra base hit all game on a triple by Carlos Peguero. It was a misplayed ball by Yoenis Cespedes who tried to dive forward to make a catch and came up short. Three singles in the first to score a run and one in the second, two in the sixth and the triple in the ninth with two out. That was it. As you may have heard, Oakland tied that game in the 8th and crushed us in the 11th with a walk off 3 run bomb from Chris Carter who was served up two straight fastballs from Steve Delebar. The game was a waste for starter Kevin Millwood who pitched 7 shutout innings and allowed only 3 hits. After the game, fans were restless, irritated, angry, and I was there too. I took my frustrations to Twitter, rather than post a similar blog post that I've written through most of our last home stand, I took the day off. Twitter was blowing up though and manager Eric Wedge was right there with the fans. Wedge made it clear that things were going to be different after the All-Star break and that he had been more than patient with this group of young players and it's clear that some of them are not going to get things figured out at the big league level. It's what we've all been waiting for, now we just have to wait and see what happens. Today, the Mariners turned a page and seemed to have the fear of demotion in their veins as they got started right away against the A's and didn't let up. They scored one run in the first on a misjudged line drive off the bat of John Jaso that went under the glove of Coco Crisp and all the way to the wall, scoring Michael Saunders and allowing Jaso to get all the way to third. The A's tied things up in the bottom of the inning on a solo homer from Josh Reddick but that would prove to be all the A's would get on the night as Vargas locked in and threw a masterpiece from then on out. He allowed just the one run on seven hits, walking one and striking out 6 getting the complete game victory. The Mariners offense continued to pile on the runs after the first. In the top of the 2nd, Casper Wells singled, Justin Smoak hit a ground rule double and Brendan Ryan followed up with a double scoring both of them and the Mariners retook the lead 3 to 1. They didn't stop there. Casper Wells smashed a fastball on a full count from Jarrod Parker that ended up in the left field seats. It was his 4th homer of the season. In the fifth inning, with two out and nobody on, the Mariners decided that they weren't done yet. Ichiro singled and stole 2nd base. Michael Saunders walked and then Jerry Blevins replaced Parker on the hill. Blevins walked Jaso and that brought Kyle Seager to the plate. Seager hit a ball deep into the gap in right center that hit the base of the wall and brought all three runners home as he scooted into 2nd with a 3 RBI double. The M's were now up 7 to 1 in the 5th inning. 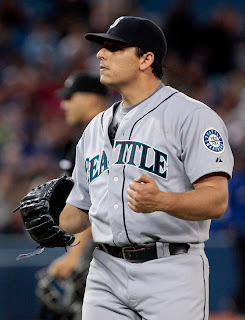 The M's got just two hits the rest of the way, but it was enough for Jason Vargas to notch another "W" after not getting a victory since June 4th. Although, in his last two starts combined he only allowed 3 runs and received a no decision in both efforts. Tonight it was all Mariners. It's not too often I get to say that so I'm taking advantage of that. 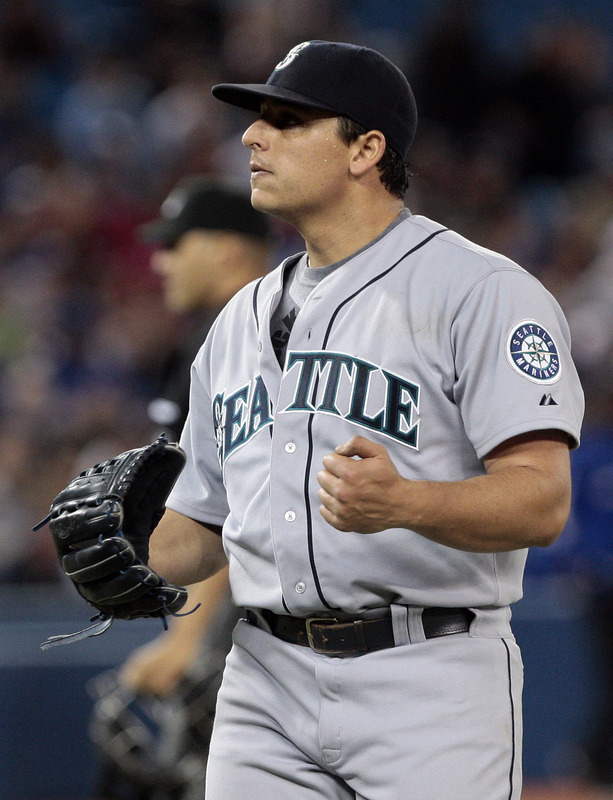 The last time the M's scored 7 or more runs was on the 20th of June in a 14 to 10 loss to the D-backs in Arizona. It has to feel good to get some crooked numbers on the board after so many poor offensive nights at the Safe. Hopefully these guys can finish the first half on a positive note, because for some, it may be their last shot at redemption.